A faulty air conditioning compressor can cause a number of problems. These are some of the most common. 1. AC blowing warm air: A failed compressor can result in warm air, or cool but not cold air, blowing when the AC is on. Lack of cooling, or intermittent cooling, can also be caused by a faulty compressor clutch. The clutch is often a part of the compressor that can’t be serviced. 2. Strange noises: Many times, a compressor that is failing internally will make a rattling noise when the AC is engaged. If the compressor is seized, it may also cause the engine drive belt to squeal — or even break — when the AC is engaged. 3. Refrigerant leak: A compressor may leak from its shaft seal, causing a refrigerant leak. These leaks are impossible to spot with the naked eye — they’re colorless, odorless and don’t leave fluid behind. To identify them, professionals often use a dye in the AC system that will light up when exposed to UV light. 4. Check engine light: In some causes, the AC compressor can cause the check engine light to come on. This is true with high-voltage, electric compressors. Before condemning the compressor, have your mechanic do a diagnosis of the air conditioning system. Most traditional AC compressors fail due to lack of lubrication. This is often due to a leak in the AC system causing a low refrigerant level. If the compressor is found to be faulty, it should be replaced. This can be a pricey repair, but is a job best left to a professional. Refrigerant is a dangerous chemical that can cause injury if improperly handled, and is very damaging to the environment. To replace the compressor, the AC system will need to be evacuated and recharged using special equipment. Several other components may need to be replaced as well if the faulty compressor has contaminated the system with metal. Servicing high-voltage, electric compressors is extremely dangerous. The electrical current from hybrid systems can be deadly. Only trained professionals using proper equipment should attempt to replace an electric compressor. The compressor pumps refrigerant throughout the vehicle’s air conditioning system and increases the pressure of the refrigerant to keep the car cool. Most AC compressors are driven off the engine’s crankshaft by a drive belt. The compressor itself doesn’t run unless you engage its clutch by turning the air conditioning on in the car’s cabin. 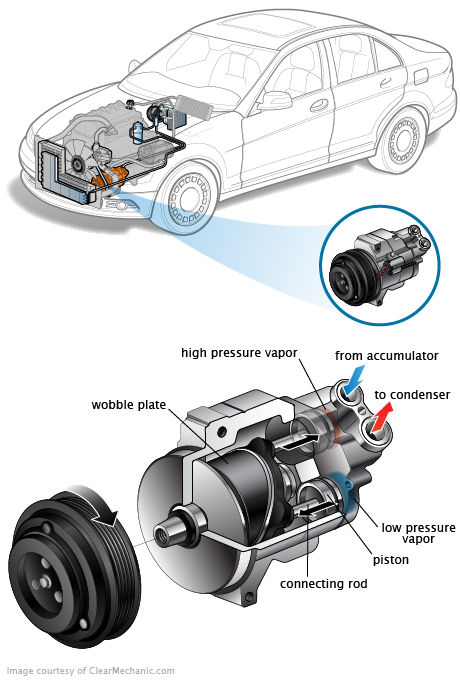 On most late-model vehicles, a computer receives the request for cool air and responds by turning on a solenoid to engage the AC compressor clutch. And on some newer vehicles, the compressor actually runs all the time, though it can be turned off by pressing the ECO button. Early hybrid vehicles used a belt-driven AC compressor, similar to those found on traditional vehicles. That changed in 2004 when Toyota introduced an electrically driven compressor on the Prius. Currently, most hybrid and electric vehicles use an electric AC compressor. Instead of being driven off the engine by a belt, these compressors run completely off high voltage from the hybrid system.